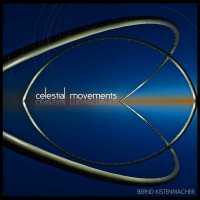 Bernd, after a 7-year break, you made a new entrance on the Em scene with your 2009-album “Celestial Movements”. What made you decide to do so, and how did that come about? Well, the break was necessary, because I had nothing more to add to the em-scene and nothing musically to say. I did not want to make the same mistake, which others do if they repeat themselves again and again. The economic situation around my label MIRecords was also very difficult. So in 2001, I decided to put an end to everything concerning music and concentrate more on private things. I needed this distance and there were moments where I realized their may never be a return to music again. This was until a moment in 2008, when two things happened.First, due to questions about the MIRecords back catalogue, I was in contact with Bernd Scholl. He was starting-up his label MellowJet Records in those days and I could tell him something about my own experiences with music labels. We exchanged a lot of thoughts and one of them was the release of a new solo-album. I didn’t answer with a quick “Yes” because it was something very difficult for me to decide at that moment. On the other hand, there was this thought in my mind which did not leave me. Secondly, since the start of my musical activitities I kept a long time contact and friendship with Olivier Bégué from France. He is the head of the “Cosmiccagibi” fan-organization. In this long period we regularly stayed in touch and discussed thousands of things.Then, in November 2008, Olivier and two of his friends (Christian Piednoir and Michel Le Stum) paid me a visit in Berlin and asked me to return on stage. This meeting was the starting point for many things, as it was THE moment I decided to return (into my studio and back on stage as well), and it was also the beginning of a true friendship. These guys helped me so much and they are still doing so until today. Christian Piednoir for example is a professional photographer and Michel le Stum is a graphic artist responsible for my cd artwork. When it was clear I would return on stage, I also needed a new album. The motivation was very high now and I decided to release a new cd with MellowJet Records. Until now, Bernd Scholl does a very good job and it was the right decision to work with him. You premiered the new album live in concert in a theatre in Paris, and not in your home country. How did you prepare yourself for this concert after your long absence? 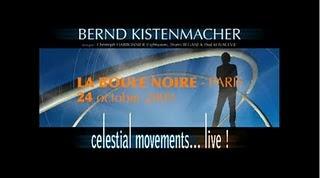 As said, things were set in motion and on October 24 2009, I did my first concert after 9 years of absence in La Boule Noire in Paris, an event organized by Cosmiccagibi. There I played “Celestial Movements” live, my first cd in 8 years. “Celestial Movements” was inspired by the horizontal observatory at Halde Hoheward in the German Ruhrgebiet area. This huge construction has an astronomical use as well also being a kind of landmark. So when I thought about my first music after such a long time, I didn’t want to sound as I did before my break. One approach was to compose shorter and more compact tracks without endless solos. Another approach was to focus on a special theme, as I still like the idea of a concept album. You have a special theme and you can build your acoustic interpretations around this. “Celestial Movements” was dedicated to the Halde Hoheward installation, which has a celestial “meaning”, while the cosmic theme left me also enough space for more personal reflections. The track title “Eternal Lights” for example does not only point to the stars in the universe which seem to shine forever, it also applies to the souls of the beloved people in our lives which also never stop shining. 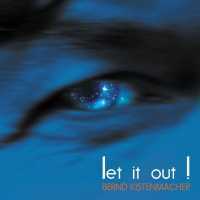 Bernd, your most recent release is “Let it Out!”. This lengthy 41-minute track seems a (last) personal statement and contribution to the famous Berliner School style.. Yes, “Let It Out!” is very special and may musically seem a step backwards compared to my more current musical releases. You may ask yourself why I did on purpose. I could simply say “because I still can do it”, but this answer is too simple. “Let it Out!” was based on an idea. The idea was to create a musical bow from the beginnings of “my” musical roots to my recent and more –lets say- symphonic and cinematic style. I created a “40 years in 40 minutes” track especially for my concert during the “Ricochet Gathering” festival in Berlin in 2010. This festival was very special, because of the place and the occasion to celebrate a “look back” to the roots of Berlin School music right at the place were all started. The festival location was the famous Rathaus Schoeneberg, a place with historical past. Schoeneberg is also one of Berlins counties and THE county where the first (electronic and experimental) musical steps where gone by the protagonists, which we all know. Most of them also lived in Schoeneberg. All this began there about 40 years ago. So the moment to celebrate all this was perfect timing. Many artists were invited to perform and meet there, and as I said, it was a special moment at a special place. “Let It Out!” was my personal comment on this and at least unique. I was invited in August 2010 to participate in the event by Vik Rek. This meant there was not much time for preparation. So the title also reflects the spontaneous outcome. Did you need to get this music off your chest to move on in the more contemporary /progressive style heard on “Celestial Movements” and “Into the Deep”? Well, during the whole process of composing music, I have learned to follow my inner voice. I am more “honest” to myself. This sounds simple, but I have never done this in the past because I thought too much about possible reactions of the people. This limited myself severly. Today, when I have an idea, I just play it. I also have a notepad where I put down all my ideas, ranging from titles to concepts. I follow any impulse I get. Another thing is I must more or less finish a track to get it out of my head. This is necessary to make room for the next one and it helps me to concentrate and focus. I stick to the formulae: do it now, don’t leave things til tomorrow. Sometimes it happens, I later on listen to my music and think to my self: how was I able to do this? What did actually happen? It’’s like a “rush”. A pressure to let the music out. This makes me extemely happy. A track like “At the black smokers bar” would not exist without that trust into my own creativity. With “Let It Out!” something silmilar happened. I had to do it before I could move on and open up my mind for other ideas and challenges. Was there a specific reason to make “Let it Out” available as a download-only release? When “Let It Out!” was done, we discussed the use of this track. The first idea was to add some other tracks to it and to produce a new album. I disliked this idea because it was not “honest” and seemed to me a step backward. I said previously, the music was composed for “Ricochet Gathering” event, and there was nothing more to it. So we only had this unique track and after some discussions with Michel Le Stum and Bernd Scholl, I decided to go one step forward and to offer it in download-format only. Things become more worthy, if nothing is around them. It is clear to us, that not all fans will be satisfied with this decision. But this will not touch other plans from MellowJet to release cds again. At the moment, downloads are doing quite well. It’s too early for a proper analysis, but it could be the way how music is made available in the future. Bernd, could you please comment some more on how you think music should be released these days, the decline of the cd, the huge change within the music and record industry? My personal point of view is that we witness the end of compact discs. It will not happen today nor tomorrow, but in the near future. Downloading music has become so simple. Transmission of full-audio quality is possible. I do not mean all illegal things connected to it. I really hate this because beside the wrong moral behind this behavior, there’s also real financial harm done to all who are involved into the music process, a process that starts with the creation of an artist, something that should not be for free. In addition, the behavior of the listeners and music consumers seems to have changed. Less and less people are obtaining full albums and more of them buy single tracks. So cd albums will more and more get the status of a “collector’s item”. On the other hand, there’s a trend backward to the so beloved vinyl lp. High-quality lp’s are selling well again in a special market. Ans there’s the ongoing discussion on audio-quality of analogue and digital formats. So the final story about this seems not yet to be told. What did you envision on the concept and the music of “Beyond the Deep”? 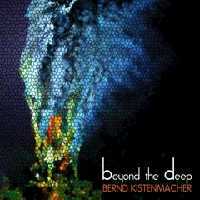 “Beyond The Deep” is another concept album and should not be regarded as continuation of “Celestial Movements”. 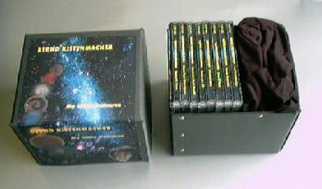 The main ideas of the album are based on the science-fiction novel “The Swarm” (Der Schwarm) by German author Frank Schätzing. No other novel had me moved so deeply as this one in the last few years. While reading the book, I started to compose the first tracks almost simultaneously. Pictures were followed by other pictures. Of course the album was not dedicated as a “score to the book” but it is true that the music reflects some special moments of the book. “Tsunami” and “Clayoquot sound” are tracks which speek for themselves. “Who will safe the world?” is eventually only understandable, if you have read the book. The final laughter in this track belongs to a scene, where all (dead) heros and protagonists meet again to reflect what had happened to them and also with the world. I had the vision of a “diner of the death” and created that moment with a final laughter releasing into eternity. But I wanted to point out something extra with this album’s music. Since our earth exists, natural catastrophes were and are allways around us. But the real disasters come from mankind itself. Our greediness seems to be endless and not stopable. So “Beyond The Deep” is a little comment on this. Yes, this is true. I try to compose music which could be described as a score for imaginary films. I would really like to do it and I hope the day will come I get the opportunity to do so. Anything I do is also a business card and should be recognized as a kind of personal reference. I will show my versatility. Berlin is an important place for films and also for music, but I fear the place is too big. There are too many people pushing something into that market. But I’m patient and will use the time being to improve myself. How do you experience the state of the electronic music scene globally, and more specific in Germany? How do you envision its future? I’ve always been confident and hopeful toward a little comeback of classic electronic music. Simply because there’s no other musical “answer” out there at the moment. Techno is past. Clubmusic belongs to the clubs. So why not leaning back and remember old times? We also have the numerous possibilities of the internet. Fast exchange of information and communication is possible without problems. Public broadcast cannot follow all trends and no longer leaves a space for special interest music. Internet opens up space for everything and this is the only but big opportunity for fans and interested audience to get information about our work. The interest in classic EM is slowly growing again. Other activitites like Schallwende-organization, Schallwelle-election, Cosmiccagibi in France, Electronic-Circus or E-Live festivals in Germany and The Netherlands help the scene as well as the fans. So final decisions depend on musical quality- as was the case in the past too. Let’s talk about your IvoryTower studio. In what way did that change in the course of time? Any favourite instruments and stuff you fancy? 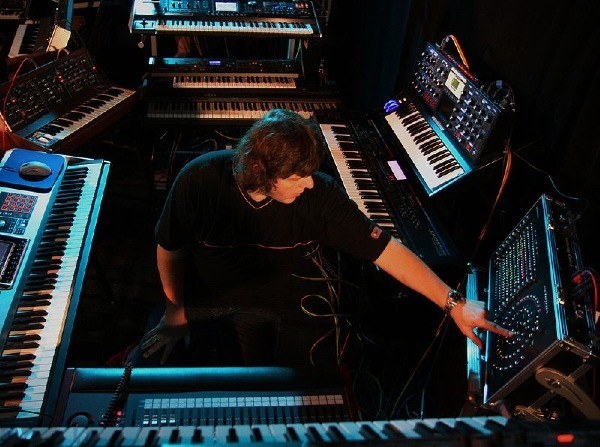 As you can see on many concert-pictures, I still use a lot of Roland synthesizers and keyboards. I also use these in my studio. I realize my main ideas with the Fantom G Workstation, but I’m currently rebuilding my studio again and prepare it for use of Cakewalks latest Sonar software. This will bring new possibities to my music. So my studio is never finished and changes with my own approach to music and production-methods. At least my recent studio has really nothing to do with my old ones. Although you have changed gear, your current sound is still is very analogue. Is this by purpose? I very much appreciate modern digital equipment, but it’s always my intention to let them sound “analogue”. Let’s say it is my style. Digital synthesizers are good for new possibilties in sound design and they are good for “control”. Today you can do much more with created sounds then ever before and at least you can store and repeat them. But for me, the sound itself needs warmth. Something special which is difficult to describe. I also use factory sounds only as foundation for something else. But I still use real analogue synthesizers here and there because their sound is so unique. You’ve got quite a lengthy discography, which you concluded years ago by means of the box-set “My Little Universe”. 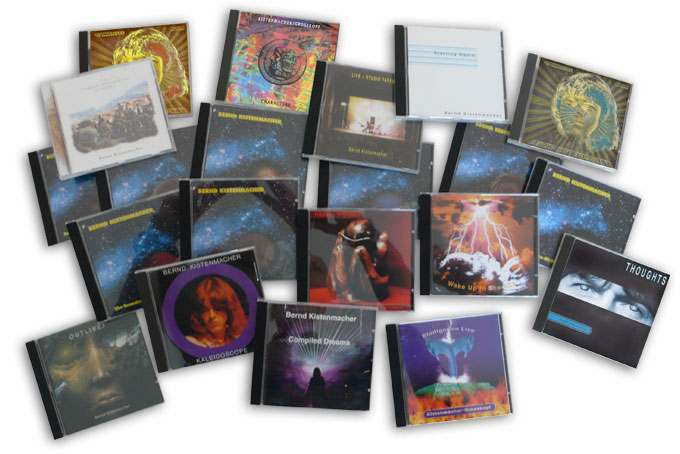 Are there any special stories and/or occurences to the albums you made so far? Not really. Because of a terrible publishing-rights situation around the most of my old tracks (which I will not deeper explain), I do not look back on this. Not at this moment. Another reason is my personal fear to fall back into old musical structures. I liked them when I played them, but it’s history now and it should stay that way. Would you consider collaborating with others musicians again, as you e.g. did with Harald Grosskopf? Well, as a matter of fact, last week I was invited to play with Robert Schroeder during the “Schallwelle” elections ceremony. We prepared a nice track and had fun performing it. As`we enjoyed ourselves so much it is absolutely possible that we will work together one day. In general, I’m open for other collaborations, but they should be mainly outside em. Looking back on your musical career, what moments are special to you? Any regrets or things you would have done different? I should have been more consequent in many things. That refers to my own musical career as well as to decisions around my label activities. I always had a too big heart, which proved not helpful in the business world of music. Also the initiative to go into two directions was wrong. I learned that there always will be a moment were you have to decide between your own way and the business-way. The artists you cooperate with have the right to expect this. I tried to do both and failed at least. This balancing act took too much of my energy and there were moments I seriously did not know what music I should play anymore. Too much sorrows killed my creativity and I told myself I will never fall back into that status again. Do you regularly listen to any other electronic music? Who do you (still) consider big talents in the EM-scene? Honestly no. If I listen to something else I do it just for personal entertainment. I listen for example to indie-rock or pop music, which taught me a lot. I also very much enjoy listening to filmscores. I’m totally fascinated by sounds which almost instantly create images of their own.These cinematic sounds tell a story on their own, they reveal the hidden powers of music. But back to your question. The main reason why I’m not listening so much to other electronic music is simple. I don’t want to disturb my own creativity. I must cease the moment and follow my own path through the fascinating world of music by exploring my own ideas. There are a lot of talented and mature musicians out there. But “finding the right way” through this business needs more than just talent. I also needed a persisting and confident attitude to get to where I am now….